Keeping cows in good condition in fall and early winter ultimately helps insulate cows and minimizes the amount of feed required later in the winter season. 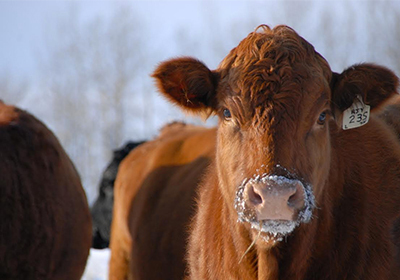 Now that the first blast of winter weather is quickly approaching, have you thought about what that means to your cows? Cold temperatures significantly raise energy requirements. Undeveloped winter hair coats, wet hides and wind all combine to magnify this increase in energy requirements. The combination of calving cows and colder environmental conditions can easily result in producers not providing enough feed energy and cows losing weight. 1) Feed higher quality hay (with more energy) and expect cows to increase intake. Without a forage analysis, you cannot be exactly sure of your hay’s energy level, which can lead to inadequate nutrition. BioZyme offers complimentary hay testing and nutrition analysis to producers through its nationwide dealer network and Area Sales Managers. For more information, visit http://vitaferm.com/testyourhay/. 2) Feed cattle a supplement, such as BioZyme’s Amaferm®, that improves digestibility of their feed and helps ensure that they are extracting all of the energy possible. Research with Amaferm has shown benefits similar to feeding at least 1lb. of grain. 3) Consider moving cows to locations with protection from the wind and wet weather. The energy requirement of beef cattle increases about 3% for each degree that the wind chill is below 59 degrees F. This increases even further in wet conditions and prior to fully developing a winter hair coat. 4) Match animal nutrition requirements to the quality of your forage. Heifers and thin cows require a more energy-dense diet, compared to older or fleshy cows. Sorting animals into groups based on body condition allows you to feed the available forage more effectively. Start by targeting your higher quality, more immature forages toward heifers and thin cows. These earlier harvested forages will be the most energy dense as energy declines considerably with maturity. The older and higher body condition cows can then be fed slightly more mature forage. This allows you to maximize the use of your forage supply while better targeting the nutritional needs of your entire herd. 5) A good guideline is to feed 3-6 lbs. of energy supplements like soyhulls, corn gluten feed, or corn to avoid weight loss during these stressful periods. The bottom line is, early cold stress can result in a snowball effect if left unchecked. Keeping cows in good condition in fall and early winter ultimately helps insulate cows and minimizes the amount of feed required later in the winter season. Now is the time to take an honest evaluation of body condition and match your feeding program to the needs of your cows. Kevin Glaubius provides nutritional field sales support, leadership and training at BioZyme Inc. Kevin has more than 26 years of industry experience with expertise in nutrition and management in cow/calf, stocker and feedlot cattle.